Our first morning, everyone else headed off to see the famous Srinagar gardens but I elected to stay behind and lounge. I puttered, fiddled with my camera, watched the light play across the water and just contemplated life a bit from the veranda of the houseboat. All very calm and delightful and I chatted with those of the men on their shakiras who seemed interested in doing so. An ernest young fellow selling flowers insisted on giving me some even though I didn’t buy any. No women though to talk to or even see. All the staff on board are men, all the boatmen – are men (well duh) and while they are perfectly nice there is a small but noticible difference in the way they interact and look at us I think. Is it because they are Muslim or because they are much more accustomed to making their living off the tourists so tend to see us as “commodities”? I don’t know the answer offhand – but it bears discussion with the group at some point I think. After the rest of the crew returned and a superb lunch we clambered back into the shakiras for a tour around the lake towards sunset. The locals stake out sections of the lake as their own and “farm” the water lilies to feed their cattle. They also build these clever floating islands where they grow vegetables and they are strong enough to actually stand on! Returning to the houseboat we were met by a hoard it seemed, of waterborne merchants. Tinkers, tailors, jewellers and pashmina hawkers all descended on us and I believe that collectively we managed to greatly add to the local economy! I bought presents for friends and family, and had the tailor whip up two silk kurta outfits which were delivered the next day. I think that that is a very civilized way to shop but far, far too easy! 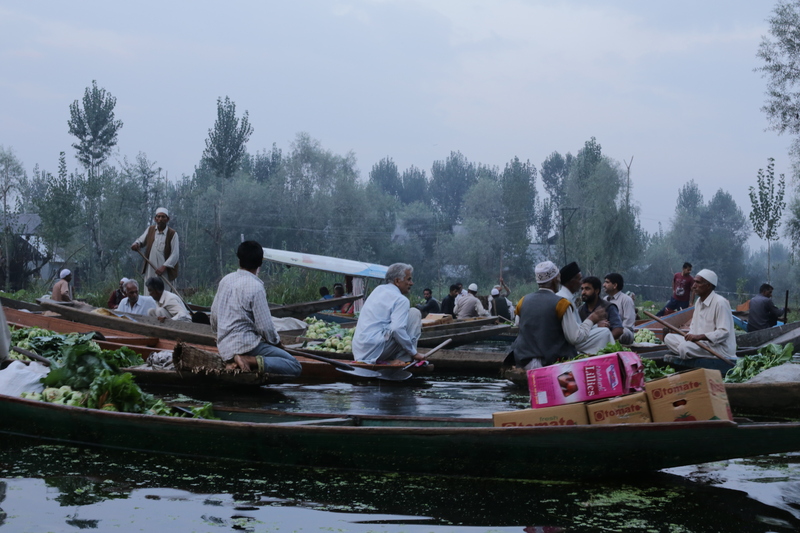 Our last morning we got up at 5 to paddle out to the local vegetable market, which is held out in the middle of the lake and is like a slow-motion, balletic sort of scrum carried out on flat bottomed sculls. Most of the vegies being traded were completely unknown; some pimply cucumber looking things, possibly kohlrabi, a variety of spinach perhaps but all else was a mystery. Fun to watch tho’…. Now off to the airport for our flight to Amritsar and we have been warned about the stringent security precautions.